No matter how you feel about Ridley Scott‘s Prometheus, a sequel has been under development for a couple of years. The prequel to Scott’s Alien franchise focuses on a human space expedition to help understand their origins. 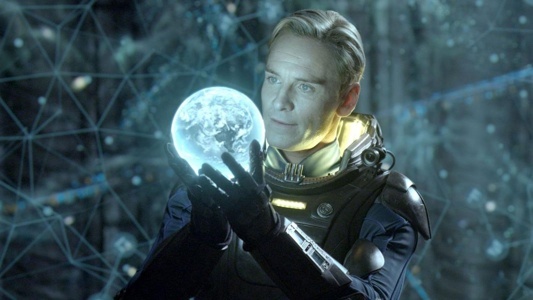 While we still don’t know much about the plot or if Noomi Rapace will reprise her role as Elizabeth Shaw for the sequel, Scott will return to direct Prometheus 2, and now he has confirmed that Michael Fassbender will reprise his role as the android David. Oh, yes. He and I are friends, because we also did The Counselor. And, I love The Counselor. No one else seemed to. At the end of Prometheus, Elizabeth and David took one of the Engineer’s spaceships to travel to the Engineer’s home planet in search of answers and to find out why the Engineers wanted to end humanity. It isn’t clear what the sequel will be about that, but Scott does manage to talk about some of the major themes that the new film will be exploring. You can either say, leave the first film alone and jump ahead, but you can’t because it ends on too specific a plot sentence as she says, I want to go where they came from, I don’t want to go back to where I came from. I thought the subtext of that film was a bit florid and grandiose, but it asks a good question: who created us? I don’t think we are here by accident. I find it otherwise hard to believe you and I are sitting here at this table, because the molecular miracles that would have had to occur were in the trillions, since the first sign of human life that crawled out of the mud with four fingers, would bloody well be impossible, unless there was some guidance system. Also, you have the sun approximately the same distance from earth as it is from maybe millions of planets and planetoids that are almost identical distance and therefore enjoy the value of sunlight on their soil. Are you telling me there are no other planets with human life? I simply don’t believe it. Moving back to Fassbender reprising his role: While the Prometheus had mixed reactions, there is no denying that Fassbender’s David was one of the best parts of the film. That being said, his shooting schedule and the planned sequel’s shooting schedule don’t quite mesh together. Previous reports say that Scott will start shooting in January, but Fassbender is currently filming Assassin’s Creed, and recently signed on to play the lead role in an adaptation of The Snowman. Fox has yet to announce a release date for Prometheus 2, but there are rumors that the sequel is having a negative effect on the development of Aliens 5. We’ll keep you posted on these stories as they continue to progress. Watch ‘The Vampire Diaries’ Season 7 Promo!